RodPrjónar: A pin button and an experiment. A pin button and an experiment. 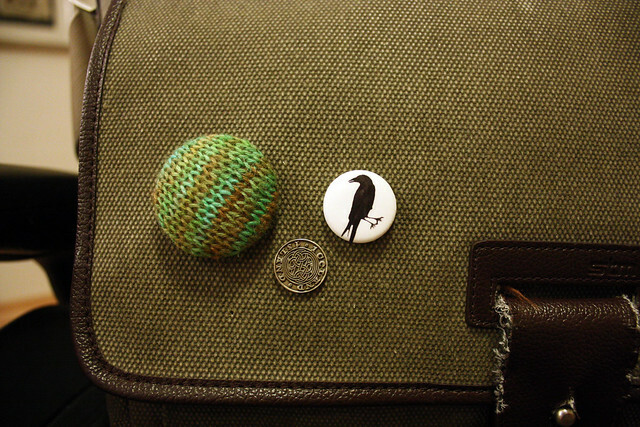 Two Sundays ago I was invited to a birthday party and there I saw a friend who had a really cute knitted pin button. I thought it was a brilliant idea. The pin button she had a very simple. It was just a little piece of knitted fabric attached to a pin-back button. I decided to try to do one and see how it worked. So, the odyssey of finding the right elements began! Which in real was only one thing: blank pin-back buttons. I went to four handcraft shops and didn't find any pin-back buttons. The most similar thing I found were there some kind of wooden buttons and pins that. But the problem was... how to attach the pin to the wooden buttons in order to have a nice and durable result. The answer was NAILS. I bought the smallest nails I found (10mm). Wooden buttons, pins and nails. In addition to these material I needed of course some scraps of yarn (from the stash) and needles. The first thing I did was to nail the pins to the back of the buttons. Even though these were the smallest nails I found they were still too long so I cut them to make them just long enough to hold the pin firmly in place. Then I knitted a piece in stockinette stitch to fit the button leaving a tail long enough to thread it all around the knitted piece and tug it to stretch the fabric on the button... and voilà! The knitted piece stretched on the button. * I casted on 10 stitches. Purled all odd number rows and increased using kfb at the beginning and end of each knitting row (even numbers) until I had 16 st. Then began decreasing on every knitting row til I had 10 stitches again and casted off. * I threaded the tail all around the border and tugged it. The not-so-pretty back side of the button. I am thinking about making a smaller one. 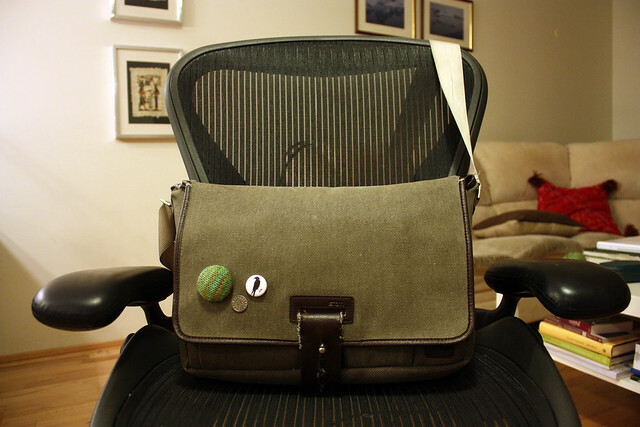 My bag is not very big and the buttons is maybe way to big for it! Last friday we went to visit Kristín Hrund, who is a master in dyeing wool, to get some help to have our own very first dyeing experience. We took some white einband, álsalt and vinsteinn (I don't know what they are called in english) and turmenic. Yes. We wanted to see how turmenic would work. It was such an amazing color... this kind of very earthy yellow. We're still VERY thrilled about the result! It is a wonderful yellow tone! And it smells really nice as well! me pregunto y que proyecto harás con la lana teñida de amarillo ??? La lana amarilla... no lo sé. Un chal? Buenísima la idea del botón, así como para identificar tejedores ¿no? ;D Para quienes no somos tan hábiles creo que podemos usar un botón ya armado y ponerle una base para bloquear la imagen anterior, antes de colocar el tejido. Y sí, claro que un chal para usar la lana amarilla. Estoy en campaña de tejer colores vivos para este invierno, he visto demasiados abrigos y chaquetas oscuras en mi ciudad y apenas estamos en otoño. ¡Saludos! Very nice idea. I love it, and love your mittens too; all of them are really beautiful. Queda el botón de vicio con esta coloración. !!!MOLA!!! glæsilegt! Svo sætur þessi hnappur/pin! .. what a great idea and the yellow of that yarn makes one to crawl into the computer and touch it... thank you very much for sharing .. I like your button pin - and all the work you went to to make it. Having all the supplies, now you can make ones in all different colors and yarns. :-)I'll have to see what I have on hand. Aeðislega saet naelan! Frábaer hugmynd. Garnið er bara algjörlega geggjað á litinn! Ertu búin að ákveða hvað þú aetlar að gera úr því? Love the knitted pin/button! Cool. 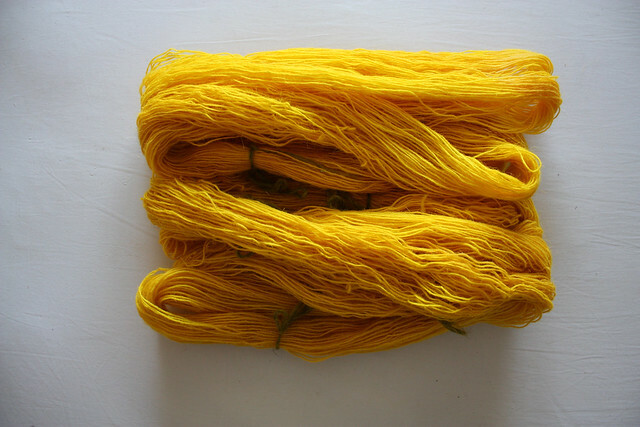 The yellow dyed yarn looks gorgeous! you clever boy! what a great idea! Tanto el pin como la lana amarilla son muy lindos. Ese chal olerá delicioso.